The musicians that formed Pearl Jam had played in various late 80s Seattle area bands such as Green River, Shadow, and Malfunkshun, with this last one later evolving into a band called Mother Love Bone. In 1990, just as that band was ready to be one of the first Seattle area bands to have an album released by a major label, Andrew Wood, the lead singer of Mother Love Bone, died from an overdose of heroin. Stone Gossard and Jeff Ament were personally at a loss as to what direction their lives should go, and didn't play together again for months. In the end, they got together with Soundgarden front man Chris Cornell who wanted to record some songs as a tribute to Wood, who had been Cornell's former roommate. This project eventually became an entire album titled Temple of the Dog, a reference to a line in the lyrics of the Mother Love Bone song Man of Golden Words. Gossard had also written music in an attempt to deal with the pain and loss of his friend. He began playing with guitarist Mike McCready, who encouraged Gossard to reconnect with Ament. These three recorded five instrumentals, and passed the recordings to former Red Hot Chili Pepper Drummer Jack Irons to see if he wanted to join the band. Irons declined the offer, but passed a tape of the instrumentals to a surfer friend of his who was living in San Diego at the time. Eddie Vedder had been singing in a San Diego band called Bad Radio while supporting himself by working part-time at a local gas station. He listened to the tunes that Gossard, Ament, and McCready had recorded and then went surfing. As the instrumentals spun through his head, he began to compose lyrics to accompany the songs. He later recorded the new songs, and sent the recordings back to Seattle where they were very well received. Vedder was invited to join in the band that was to become Pearl Jam. The band was originally called Mookie Blaylock, after an NBA basketball player who played for 13 years in the pros with three different teams. Pearl Jam's first album was titled “Ten” (there were eleven songs on the album) after Blaylock's jersey number while playing with the New Jersey Nets. 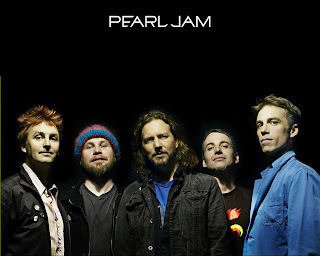 By February 2013, “Ten” had sold over ten million units, and remains Pearl Jam's biggest seller. With ten original releases to their credit, Pearl Jam has sold more than 60 million albums worldwide. Beginning in 2000 while touring behind their album Binaural, Pearl Jam began recording all of their live shows, seeking to offer “official bootlegs” of higher quality than the amateur efforts of the people who attended the shows. Eventually 72 live shows were recorded and released to members of the fan club and the general public. It was on this tour when 9 people attending the show at the Roskilde Festival in Denmark were killed by being crushed and suffocated as fans ran to the stage front. The rest of the European tour was canceled, and some of the members of Pearl Jam began to consider retirement. After a resumption of touring in the United States, Vedder said that “playing, facing crowds, being together—it enabled us to start processing it" and dealing with the tragedy. The members of Pearl Jam have always been outspoken in their political beliefs, supporting the pro-choice movement and carbon neutral and sustainable living, and opposing the election of George W. Bush. A Seattle concert in 2001 raised money to help support the United Nations programs to eliminate world hunger, and a concert in 2005 raised money for Habitat for Humanity's effort to aid victims of Hurricane Katrina. This document was last modified on Apr 16, 2014, and has been viewed countless times.